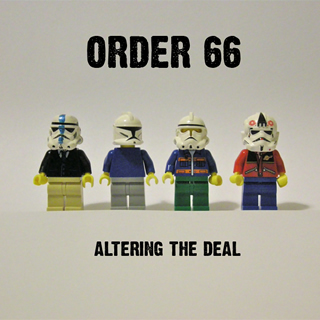 Order 66 is a pop-punk band from Surrey in England. Ah, go on, you know what pop punk is! It’s what Green Day used to play before they went weird! And here’s the thing - all our songs are about Star Wars! I know - awesome, right? The Star Wars stuff is in the lyrics, really. Some bits of the music from the movies sneak in there too, but it’s not like we just play covers of the cantina band song (there’s plenty of awesome bands taking care of that). We’ve played gigs at, like, Nambucca, and The Underworld, and with some sweet bands, like The Dogbones, Random Hand, Assorted Jelly Beans, The JB Conspiracy, Zeeb? and Mr Kamikaze - and the gigs we’ve got coming up are totally going to punish too! You can listen to it using the player on this page, or click on the cover to head over to bandcamp and buy the thing! Or, you know, download it for free. Hope you guys like it!